The Music School of Delaware spotlighted one of its most talented and accomplished alumni when violinist Barbara Govatos and duo partner pianist Marcantonio Barone took the stage to perform a concert of Beethoven, Schubert and Brahms. It’s a rare treat to hear Govatos solo in such an intimate — and familiar — setting. Normally she’s either concertizing as first violinist with The Philadelphia Orchestra (where she holds the Wilson H. and Barbara B. Taylor Chair) or collaborating with other talented instrumentalists as music director of the Delaware Chamber Music Festival. Govatos is known for her well-curated programs, and this concert did not disappoint. The first half opened with Beethoven’s chirpy Sonata No.2 in A Major and closed with Schubert’s Fantasy in C Major, a virtuosic work of complex and contrasting moods. The optimism of this half contrasted well with the fury of Brahms’ Violin Sonata No. 3 in d-minor in the second half. What is remarkable about Govatos and Barone is their shared sense of musical vision, something that was amply demonstrated throughout the concert. The duo reveled in the good-natured bantering that characterized the opening movement of the Beethoven work. The antiphonal phrases of the second movement were shaped with a delicacy that invested the music with a sense of peace. The concluding rondo banished this atmosphere, replacing it with one of playfulness. The arpeggios in violin and piano were effortlessly tossed off while Barone offered sparkling accompaniment throughout. The dominant work of the first half of the concert was Schubert’s Fantasy in C Major. Though less familiar than the composer’s later masterpieces, this single-movement work is just as extraordinary for its telescoping of musical form as the more celebrated Wanderer Fantasy for piano. The music is crammed with notes. More importantly, Schubert uses the music quite carefully to decorate crucial elements in the relationship between violin and piano. The heart of the work is its central set of variations on the tune of a song Schubert wrote in 1821, “Sei mir gegrusst” (“I greet you”). But it is the slow introduction which is recapitulated in the second and fourth movements (and fully in the third) which casts a shadow over the work. Govatos’ delivery was extraordinary, full of imagination and profound intelligence. It was worth the admission just to hear the way she colored the opening line, reducing her tone to the slenderest thread, minimizing her vibrato and breathing life into the work. Brahms’s third violin sonata in d-minor concluded the concert, and Govatos and Barone gave it a fiery, gutsy treatment. There was a constant pining in Govatos’ playing during the first movement, as she showed a range of colors — practically screaming at times — but never choking the sound. One indeed got the sense that a weighty statement had just been made and much energy expended. A blissful Adagio followed; full of emotional joy but not without bursts of passion. 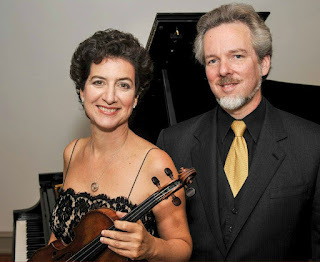 The duo sparkled in the sprightly tempo of the Scherzo but the finale was all fire — noble at first but growing more and more manic as it unraveled. This was an utterly compelling partnership of equals.